Inanch Emir, multi-award winning Artistic Director of Inanch London has been an influential hairdresser for over 25 years and has made her mark in the British Hairdressing industry in the specialised field of hair extensions. World-renowned for her expertise and unique application techniques with hair extensions, Inanch has worked with and represented the world’s leading hair extension brands amongst attracting a global clientele from A-list celebrities, top fashion/beauty editors and general clients from all walks of life. Her prestigious salon on London’s Great Portland Street has now become a destination point and centre of excellence for hair extension services. 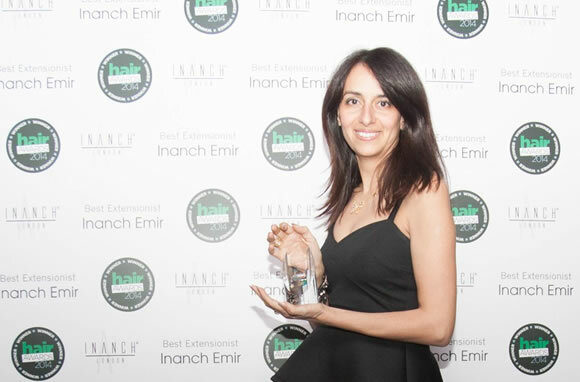 In June 2015, Inanch made hairdressing history by winning the Hair Awards “Best Extensionist” for a third year running and placing her in the Hall of Fame. She has subsequently gone on to Judge the Hair Awards for 2016. Read more for her accolades here. Also a Fellowship of British Hairdressing Gold Salon and a strong supporter of the Hairdressing Councils’ campaign for regulation in the hair industry having attained Master Craftsman status.